On Darwin’s 207th birthday, I got to share my interview with scientific illustrator, Taina Litwak of the Smithsonian Museum of Natural History and spend some time talking about the life and accomplishments of Maria Sibylla Merian, a founding ‘mother’ of illustration. The first half of the show was spent discussing Maria Sibylla Merian’s extraordinary life, especially considering the time period she existed in. Raised in a family of painters and naturalists, Merian’s passion to study silkworms and the adult silkmoths first started in 1660 when she was about 13 years old. This was long before Charles Darwin or Carolus Linnaeus and during this time ideas of spontaneous regeneration were popular theories for explaining where life came from. Despite this environment and lack of previous sources, Merian studied caterpillars to later document their lifecycles, sexual dimorphisms and multi-trophic level interactions. Merian’s later life took her to South America to illustrate and document exotic species. By this point her artwork was funding her travels and lifestyle and Merian’s independent spirit had triumphed over her time period. 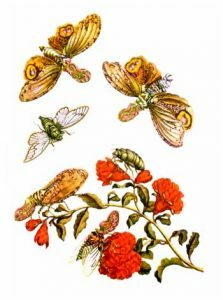 Merian’s greatest work is found in her book, Metamorphosis insectorum Surinamensium and her two daughters followed their mother’s path and also became successful natural history illustrators. Merian’s full story is elegantly covered in this article by The Atlantic. In my interview with insect illustrator Taina Litwak, we discussed modern debates about scientific illustration and its importance. 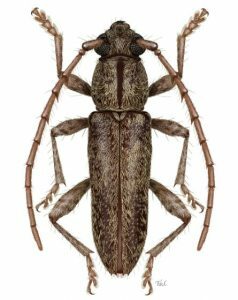 Many scientists would rather settle for a picture of their specimen, but Taina’s and other illustrator’s work brings out details that are sometimes hard to capture in a photograph. By combining multiple media sources and periodically working with live specimens, Taina’s work remains true-to-life. We also discussed the debate on scientific illustration as Art and the lack of representation of these illustrations outside of publications. For more information on Taina Litwak, another interview by the USDA’s Agricultural Research Magazine can be found here.